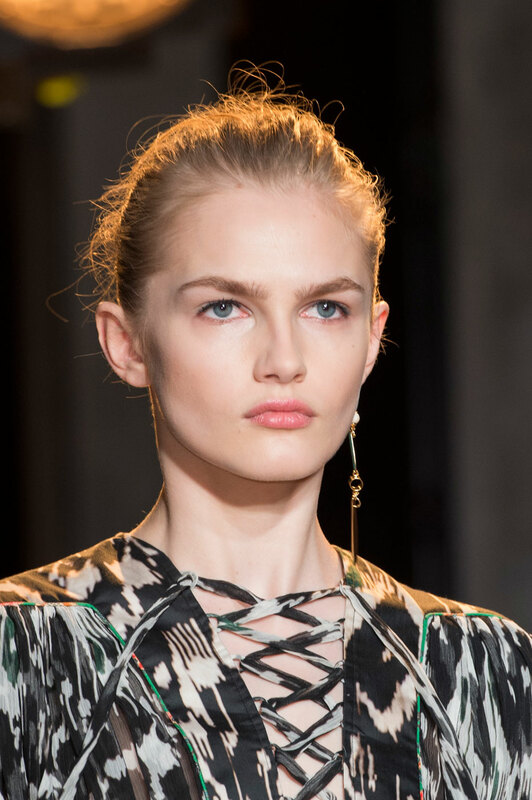 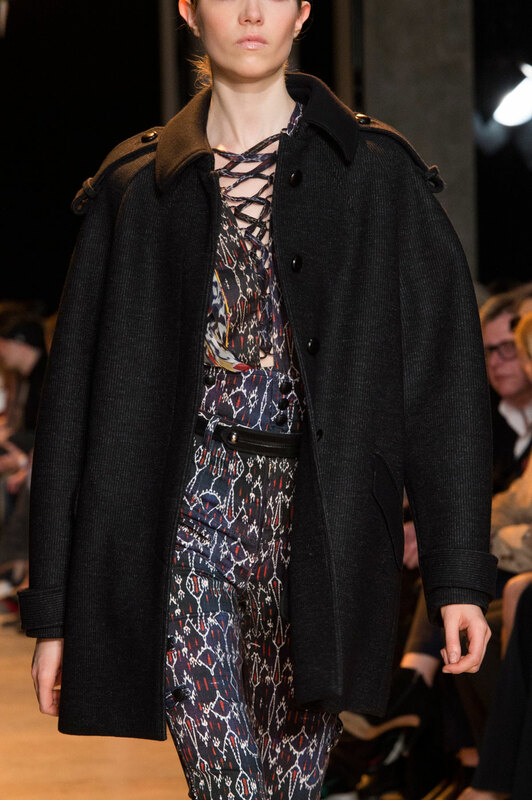 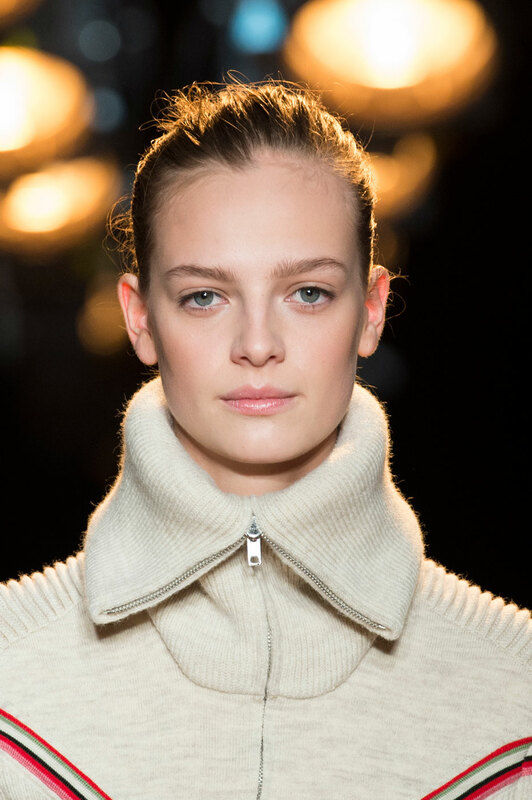 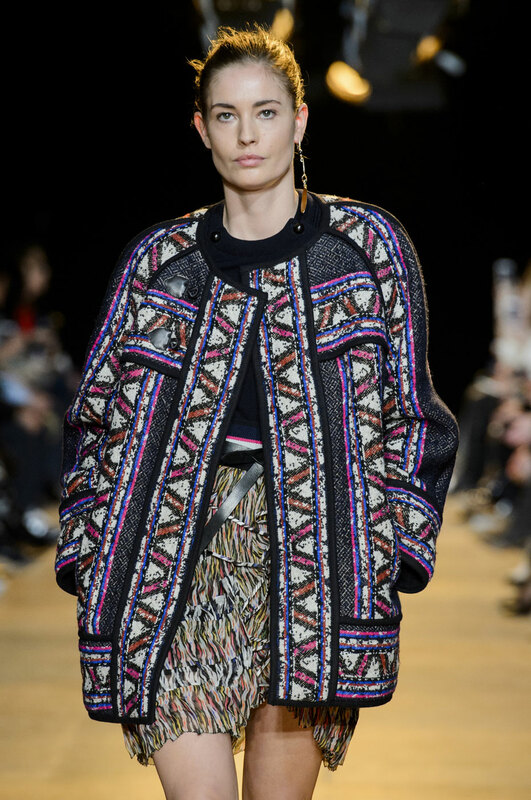 Isabel Marant Women Autumn-Winter 2015 – Renowned for her bohemian vibes, laid back aesthetic and rock girl references, Isabel Marant took her label to the next level and amped up the Parisian attitude. 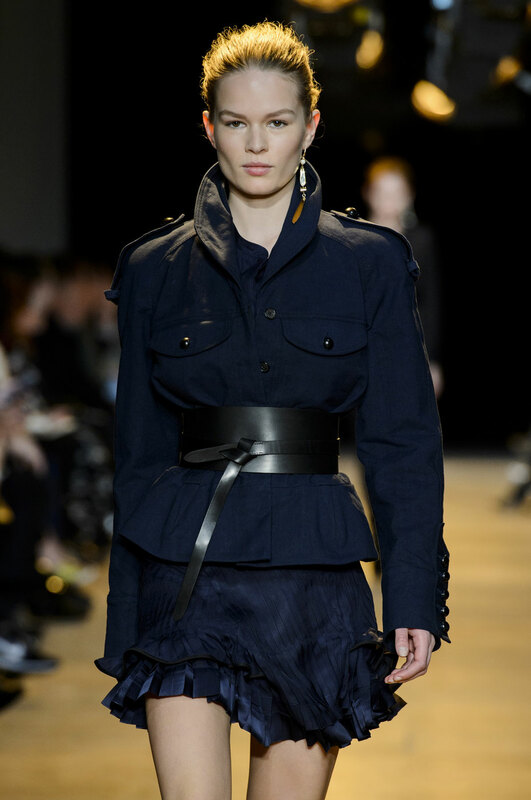 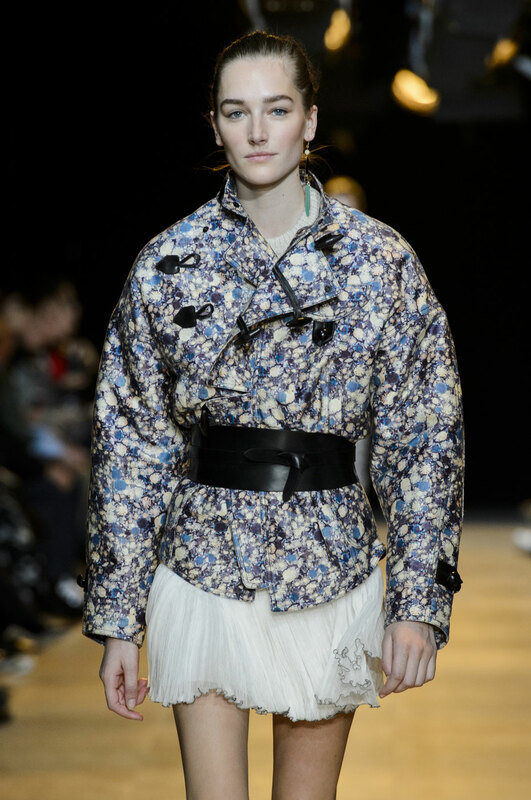 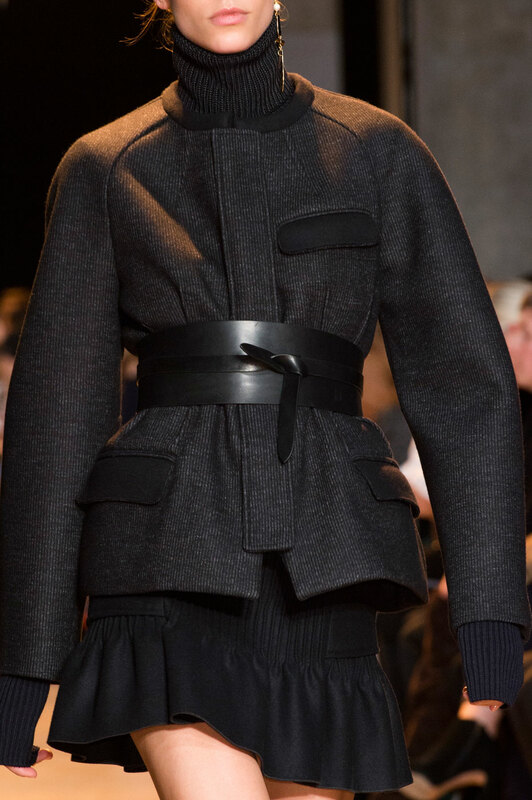 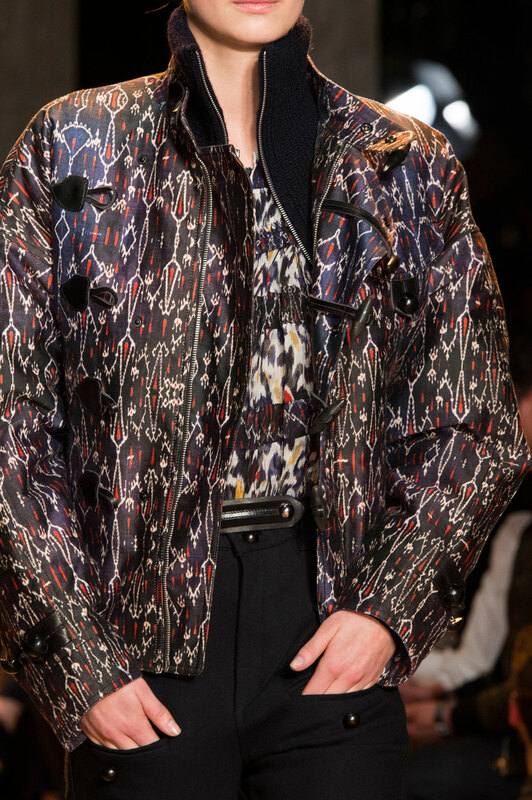 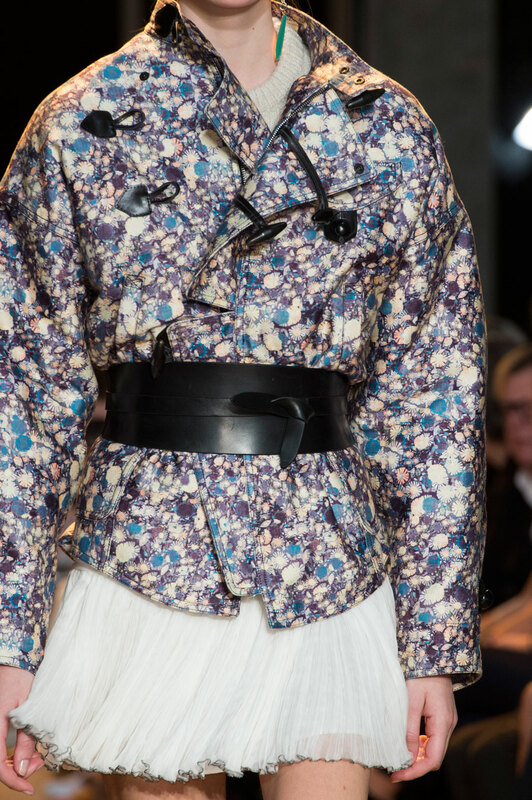 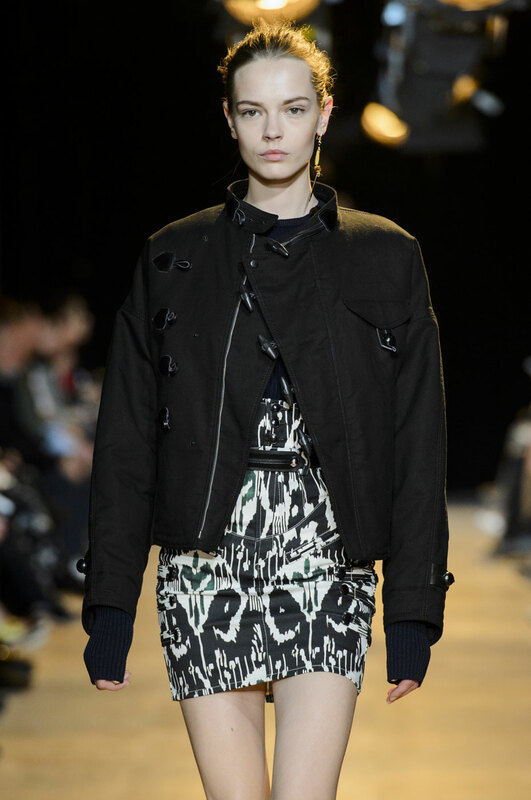 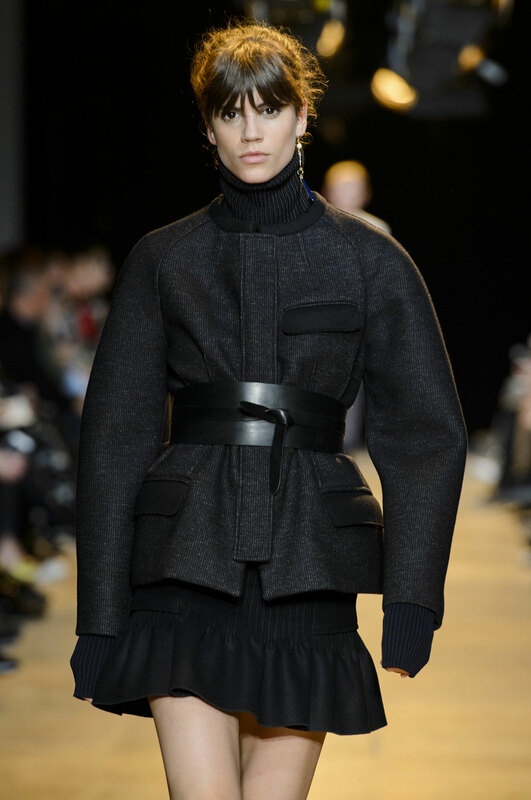 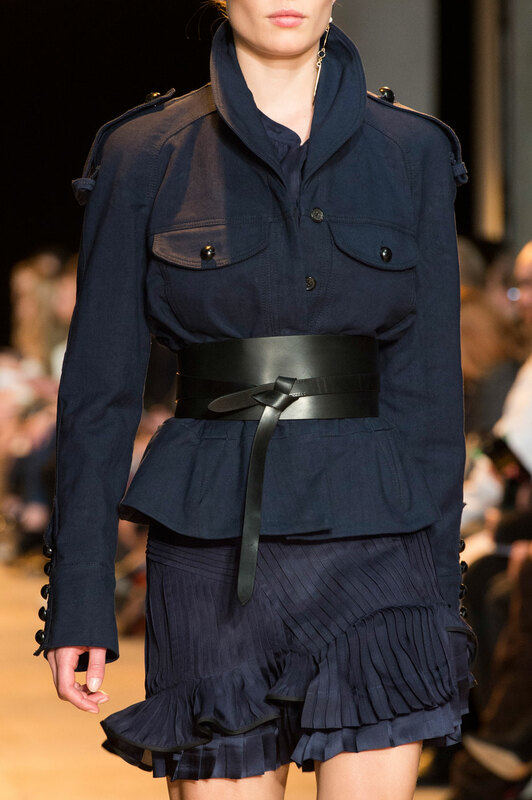 The show opened with an oversized printed bomber with toggles worn over a frilled skirt. 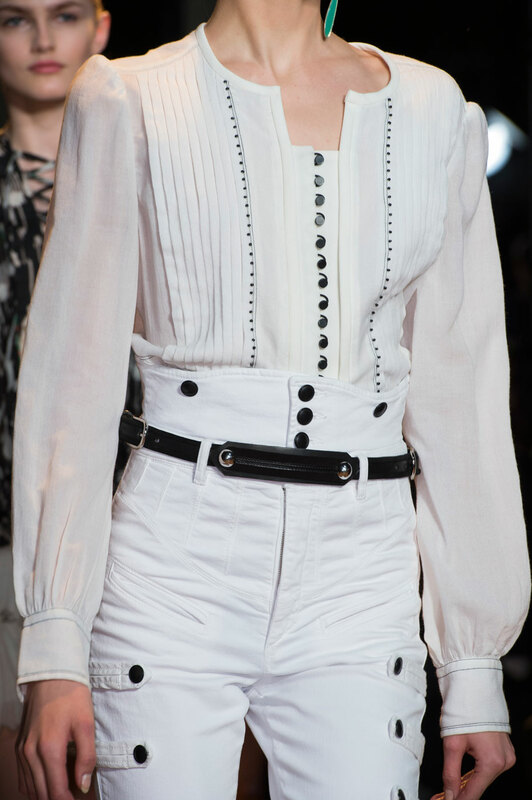 An all-white ensemble followed, with skinny high waisted jeans, perfecting the long legged silhouette Marant has come to perfect over the years. 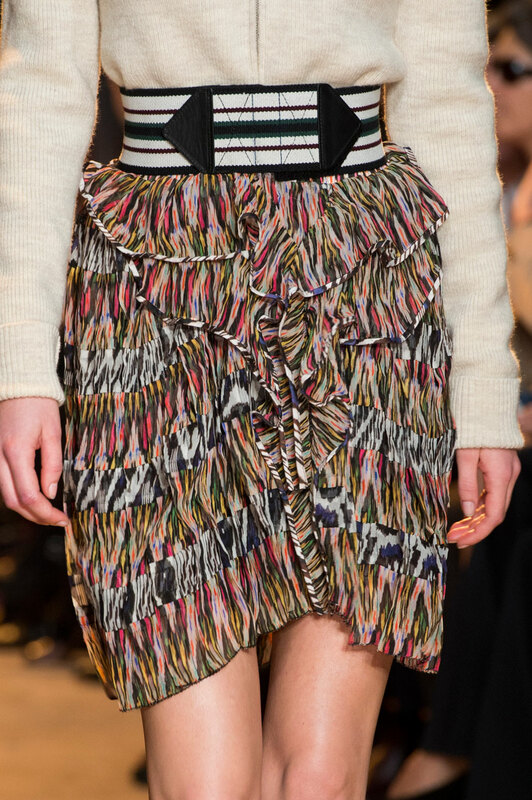 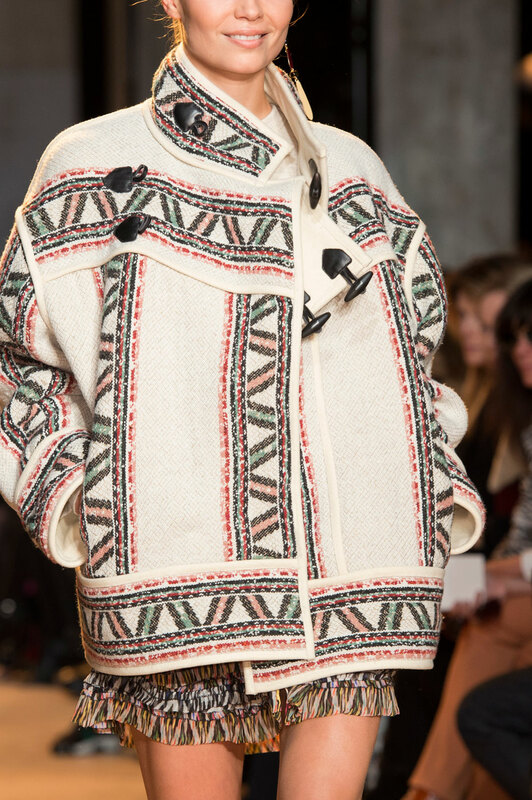 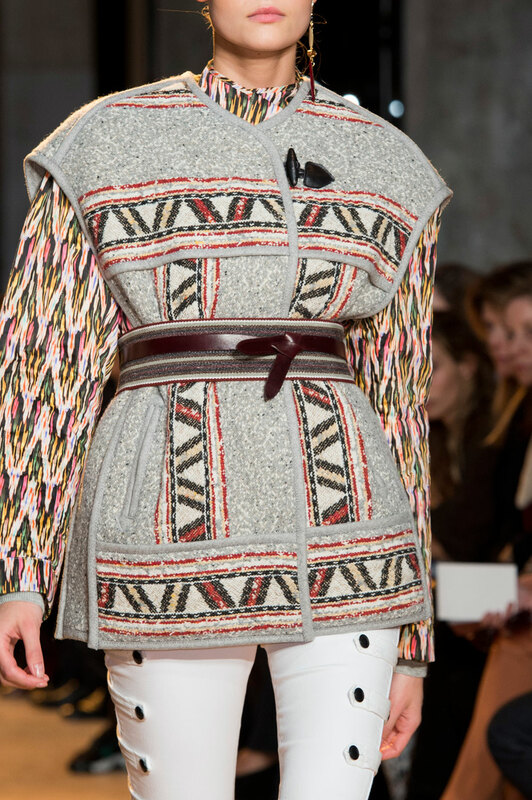 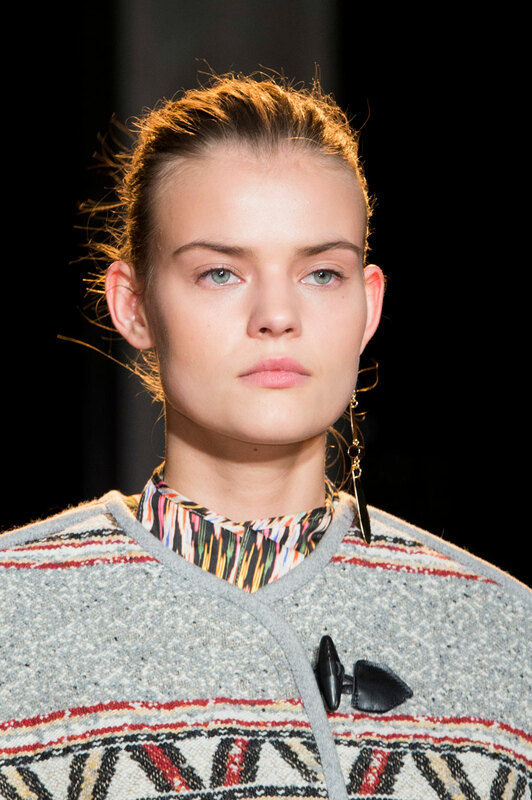 A Native American theme developed in the form of a zigzag print embroidery emblazoned on jackets and across sweaters. 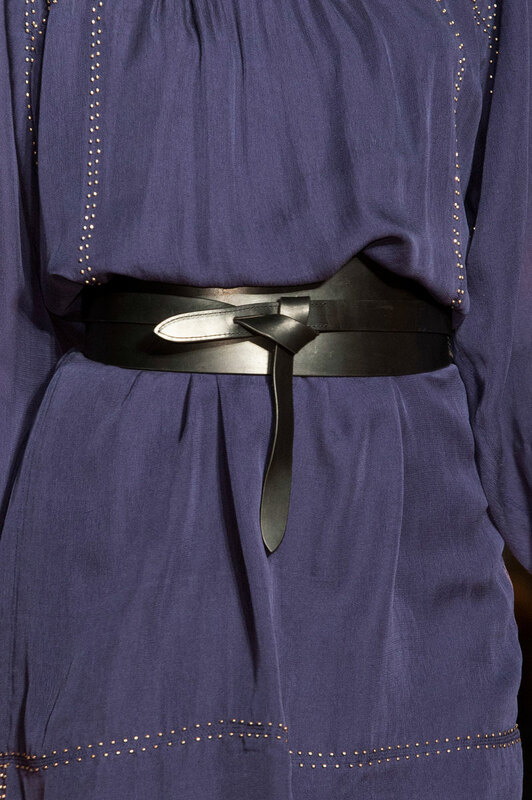 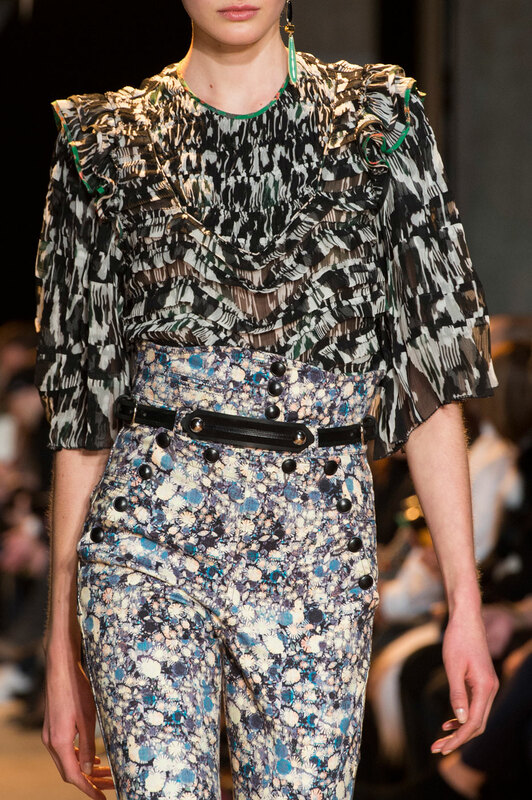 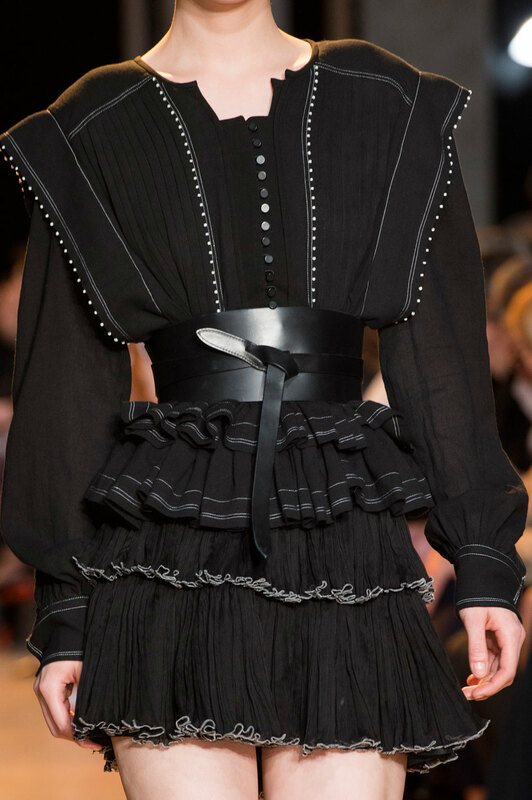 Frills were a new detail to the label and added a feminine touch to tops and skirts. 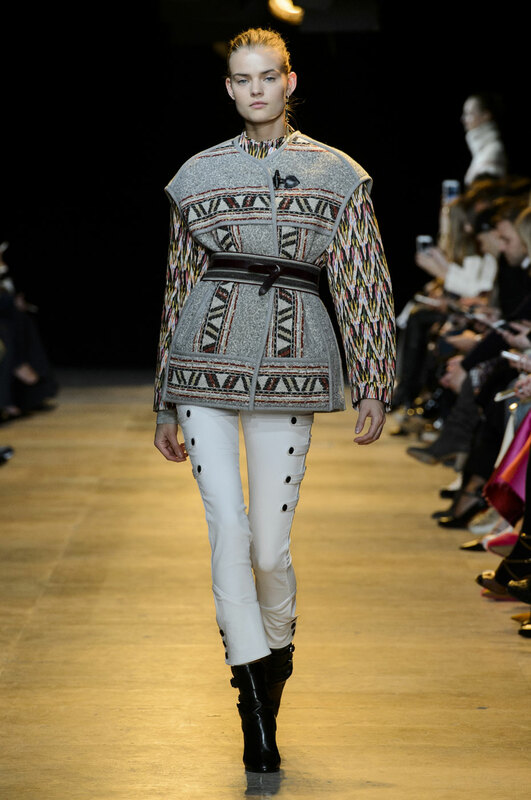 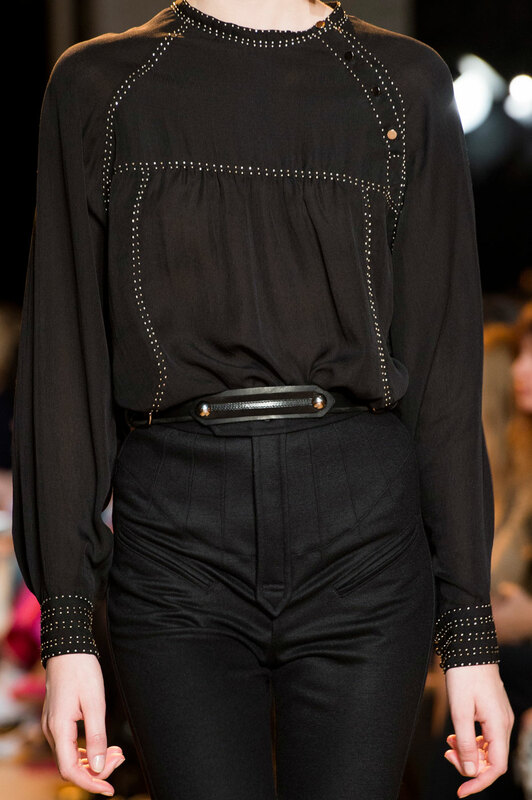 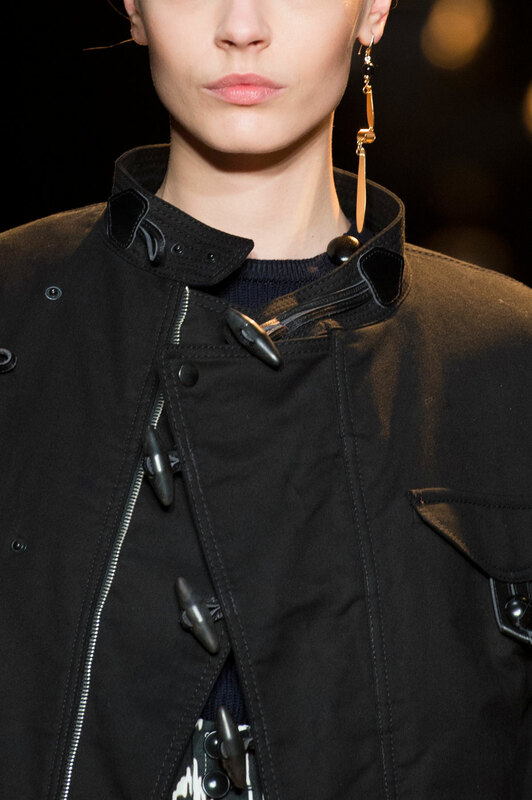 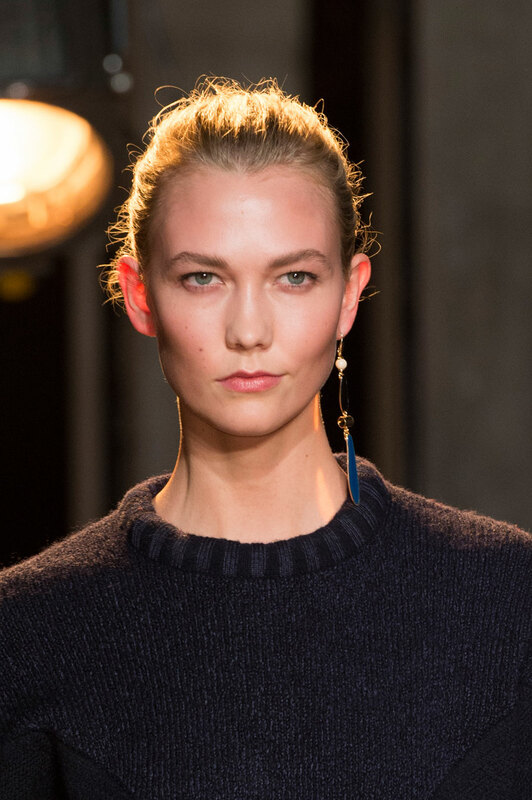 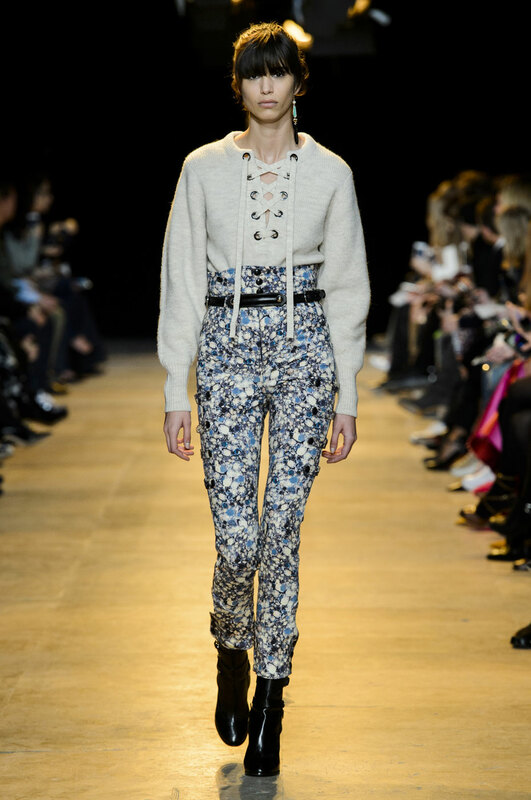 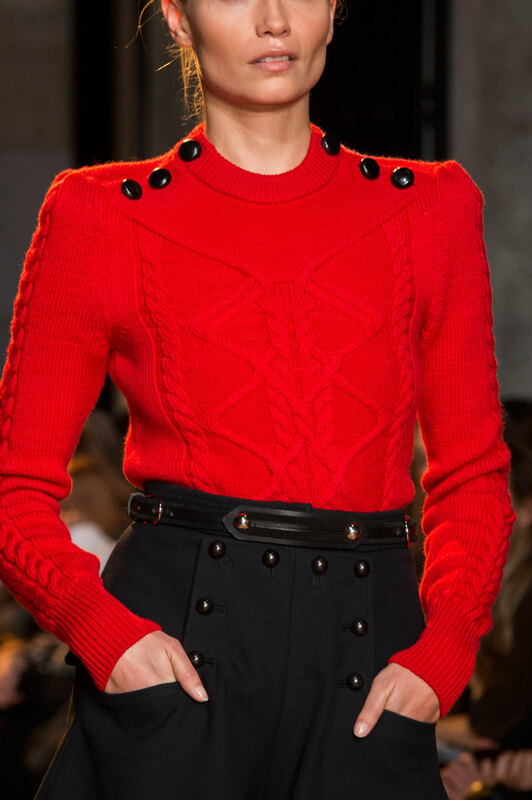 But these were not debutante frills; they were frills with attitude and for the no-frill Isabel Marant cool girl. 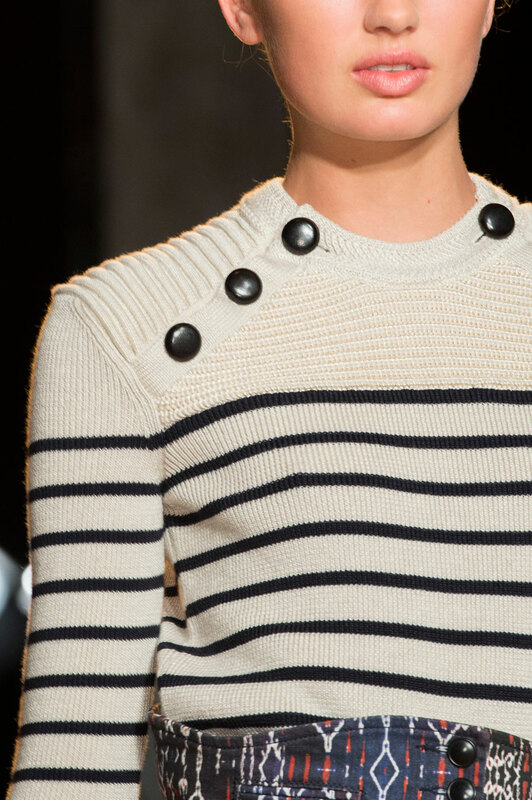 Buttons decorated many pieces. 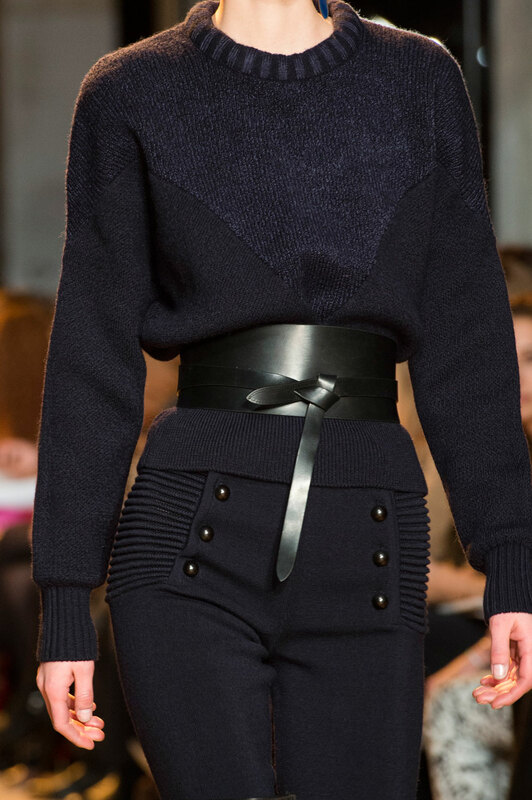 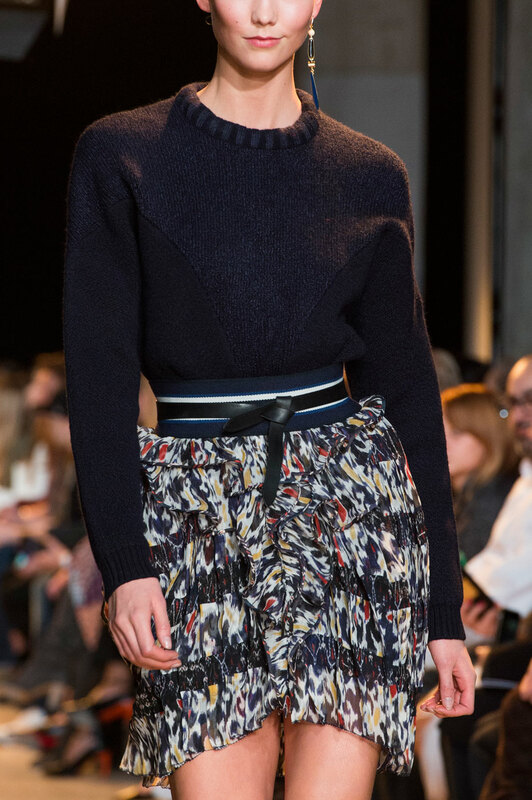 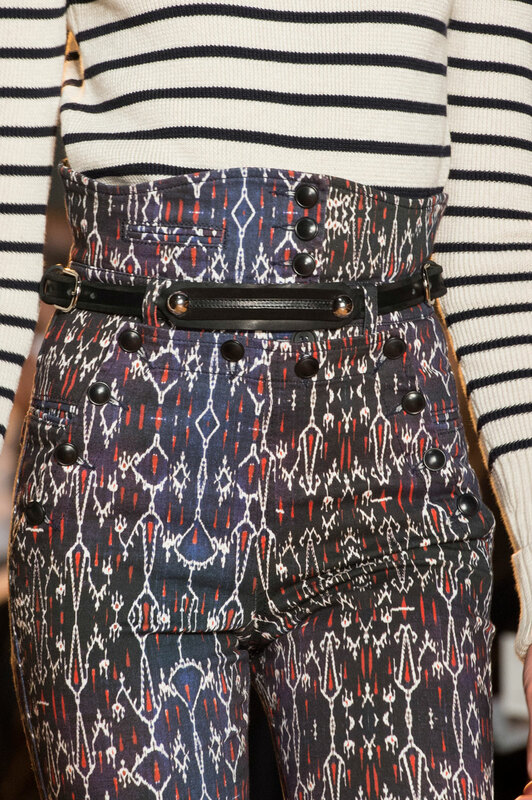 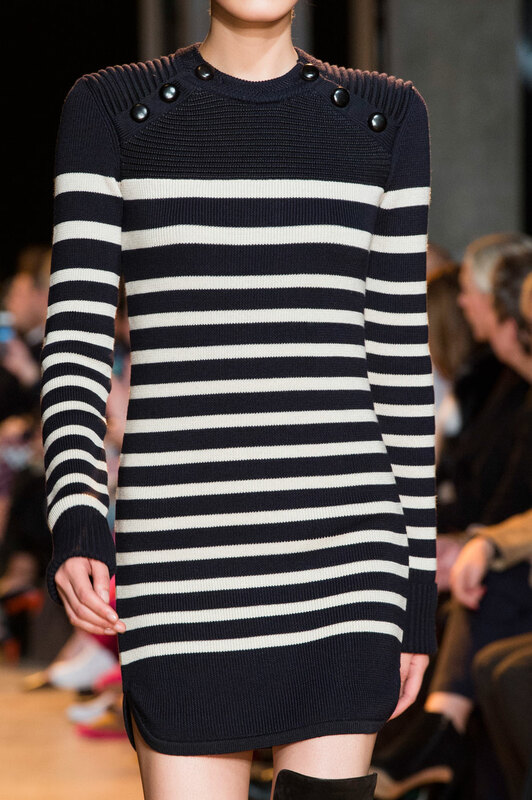 They ran down the length of thighs on shirts and trousers and across shoulders adding a nautical element. 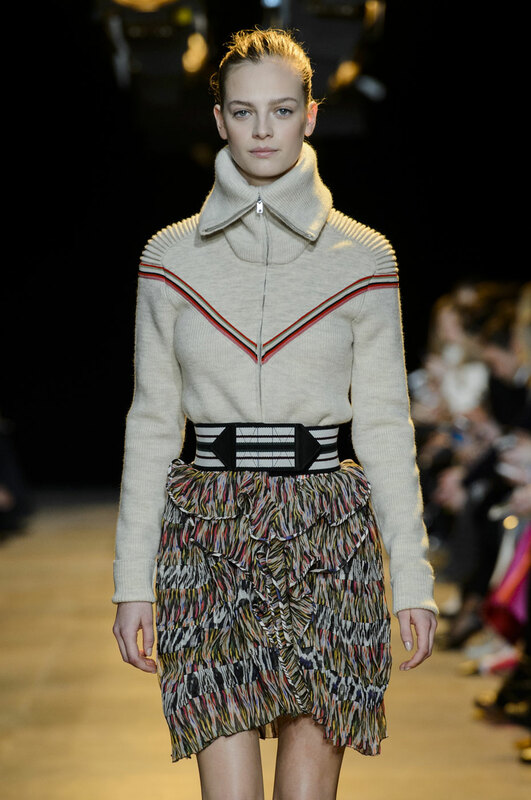 The colour palette was kept simple; black, white, navy and grey with red and brown accents. 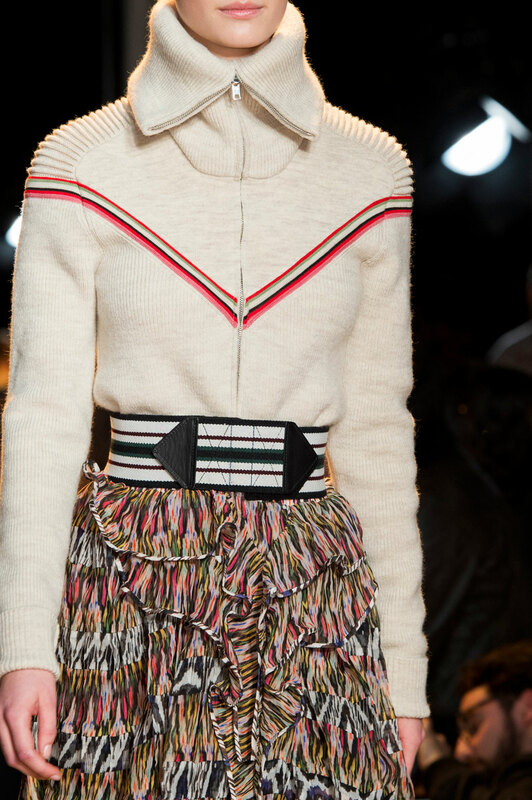 Core pieces; Miniskirts, ankle boots, skinny jeans, shaggy jackets and chunky knitwear made an appearance in the line-up, as they always do in her collection, season after season. 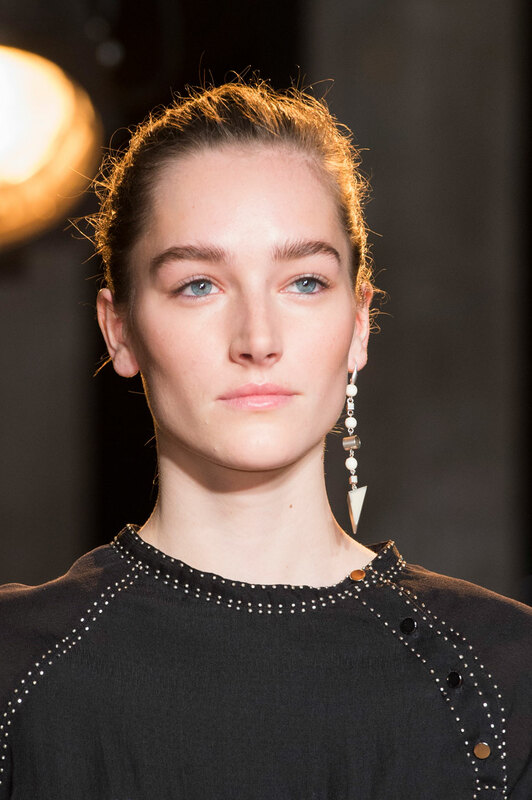 The show ended with sheer silk black and white dresses which channelled romanticism. 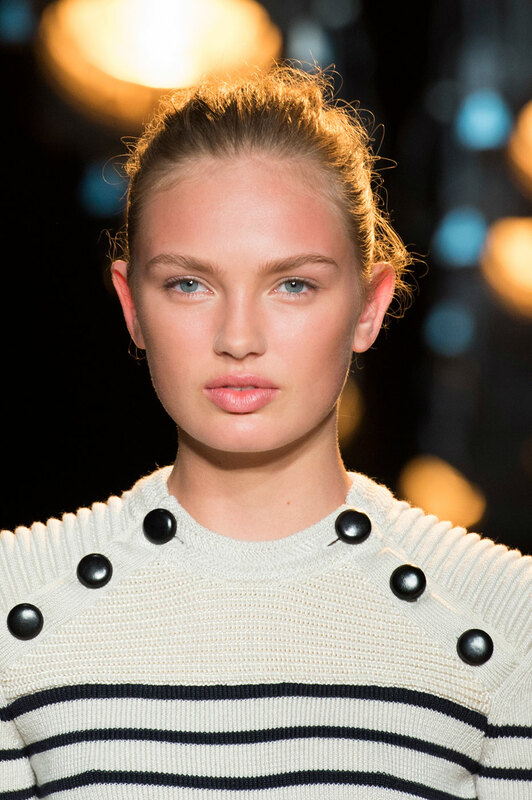 Hair was scraped up in a bun and make-up was minimal. 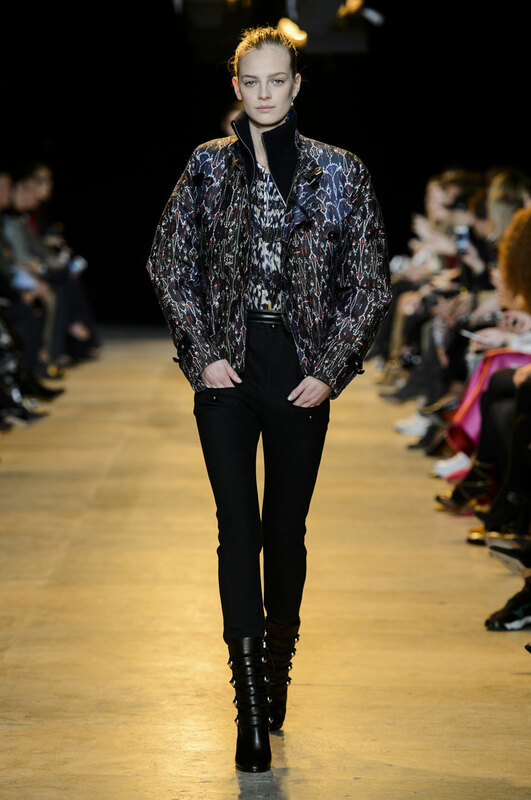 The collection was classic Marant; a little rock chick, a little hippy, short and flirty and a tough looking ankle boot. 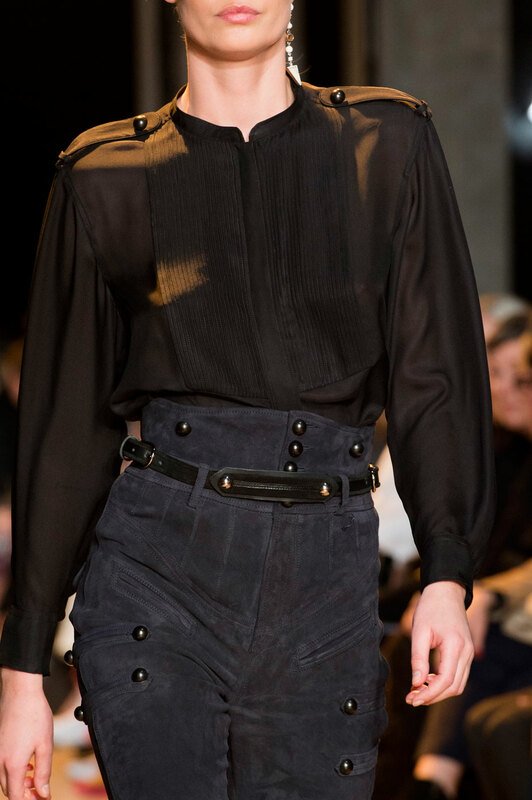 Her effortlessly cool aesthetic never fails to impress.